Media players are not new, but they have changed a bit over the years and have evolved in parallel with technology and the Internet. Some of the currently popular media players are really just streaming devices that display media from the Internet onto your TV. 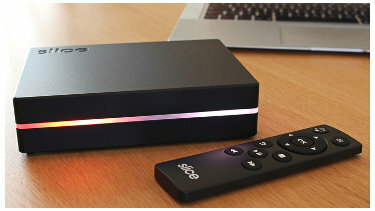 Slice feels there is still a market for a compact, efficient media player with local storage. Slice is a very compact (about the size of a hardback book) and efficient media player. It comes with a 1TB drive for storage, but can be upgraded to 2TB. An RF remote control is included so you can be anywhere in the room to get the media player to respond (i.e. you don't have to point the remote at the Slice). In addition, there is an app for iOS and Android that allows you to control the media player from your smartphone or tablet. The Slice is designed around the new Raspberry Pi Compute Module. This module is based on the original Raspberry Pi, but is much smaller. It's designed specifically for those who want to use it to power newly created devices. The Slice only draws 15 watts while running and 1 watt while on stand-by. Because of this, it doesn't generate much heat and thus a fan is not needed. This means completely silent operation, which is nice for media rooms. So why a media player with storage as opposed to a streaming player? The idea is that there may be times when you either don't have an Internet connection or you don't want to use Internet bandwidth to watch or listen to media. The fact that the Slice is small means that it's fairly portable and can be taken with you while traveling or taken to a friends house to watch movies or listen to music. For software, the Slice uses XBMC, a mature and open source software media player. XBMC can play and view most music, videos, podcasts and other files from local or network storage. When connected to your TV via an HDMI connection it will play back in full HD. Loading media on the Slice is easy. You simply plug it into your computer (like you would a USB drive) and drag and drop your media onto it. If an Internet connection is available, XBMC will automatically grab information for the media file (for example, grabbing movie summary, runtime and the cover art image). The Slice comes in an anodized aluminum case (and most likely in three color options). It has an interesting LED ring around it that moves (changes pattern and color) according to whether the media is playing, fast forwarding or rewinding. Apparently, the colors displayed by this LED ring will be user-configurable. Included are 2 USB ports that can be used to connect a hard drive or USB stick or even a wi-fi dongle. Since Slice is running on Open Source software, the creators have decided to leave Slice completely open to hackers. They plan on releasing all of the custom drivers (LED and audio) as well as hardware information (which GPIOs on the Compute Module are used and how). The Slice is currently being offered via their Kickstarter page for 179 British Pounds, which means it will most likely cost quite a bit more in US Dollars, until the exchange rate changes.